Pictured above is Silas Dwinell's Ladderbadge. 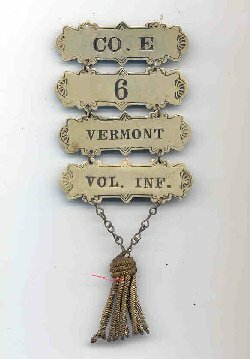 Ladderbadges were generally purchased by veterans at national encampments. Vendors could take your order and assemble them while you wait. Generally these same vendors were suttlers during the war. They would stamp the badges, some were generic IE: for state, company, etc. It's purpose was for the veteran to show unit pride. Also, they were also reusable reunion after reunion, and could be worn at post meetings. in Silas's case living in CT after the war and being a Post Commander, he could show his affiliation with the Vermont Brigade.